Quick response (QR) code or matrix code is a two-dimensional barcode has increased in popularity during the last few years. They were originally invented in 1994 by a Toyota subsidiary Denso Wave to track vehicles and parts during the manufacturing. They are capable of storing more information and more character types. The structure of QR code is a kind of matrix symbol, which consists of black modules (square dots) on a square grid with a white background  [Figure 1]. In dentistry QR code can be used as procedure reminder in clinic for infrequently performed procedures, such as checking the oxygen tank, starting up/shutting down the X-ray processor, etc. QR code linked to a short video can be helpful in describing patient selection criteria, tips for successful completion of the competency, and common errors. It can also be used in the dental assisting clinic for tray setup guide, and on surgical instruments to identify devices in order for better management and to contribute to patient safety. Radiographs are valuable aids in the oral health care of infants, children, adolescents, and persons with special health care needs. They are used to diagnose oral diseases, to monitor dentofacial development, the progress of therapy and on routine purpose. Difficulties are encountered in maintaining records containing the case history, radiographic report for long-term preservation and lot of time is wasted on searching records pertaining to the same. In the present article, we are describing an innovative approach to record these details using QR code. Protocol followed is described below [Figure 2]. of the patient was taken and interpretation was done. the interpretation of the radiograph, a QR code is generated with QR code generator software which encodes for radiographic interpretation and patients details. QR code will be attached to the radiograph cover on the reverse side. QR codes can be stored in the computer or on a paper for documentation and can be sent to the patient through E-mail or mobile. The approach enables to have both case history and radiographic interpretation coded and scanned on the radiograph cover, which can be read using a QR scanner or with a mobile having QR code scanner software. The emerging trend of QR code has gained interest in different fields of dentistry. It provides an easy way in maintaining case records and biopsy reports in histopathology. In community dentistry, helps to maintain follows-up records. QR codes on the casts and dentures help in easy recognition. Updating the tooth eruption patterns is made easy by using this code. In orthodontics tooth movement details can be updated instead of maintaining the case report that takes a longer time. In the graduate and undergraduate teaching institution QR code helps in learning process as it is of help by using it for spot diagnosis of casts and developmental anomalies. The working of an electronic dental chair, the dental material composition information and methods of material manipulation, step-wise guidance to procedures such as impression making and cavity preparation can be decoded by QR code in clinical dentistry. Quick response code, a new approach in Radiology, should be practiced in order to facilitate early diagnosis and to facilitate long-term retrospective studies, which saves a lot of time, by electronically recording the details, and provides ease of accessibility from anywhere in the world, maintaining confidentiality of report information. Diazgranados M, Funk VA. Utility of QR codes in biological collections. PhytoKeys 2013:21-34. Sahu SK, Gonnade SK. QR code and application in India. Int J Recent Technol Eng 2013;2:26-8. Sharma V. A study of malicious QR codes. Int J Comput Intell Inf Secur 2012;3:12-7. Chuang JC, Hu YC, Ko HJ. 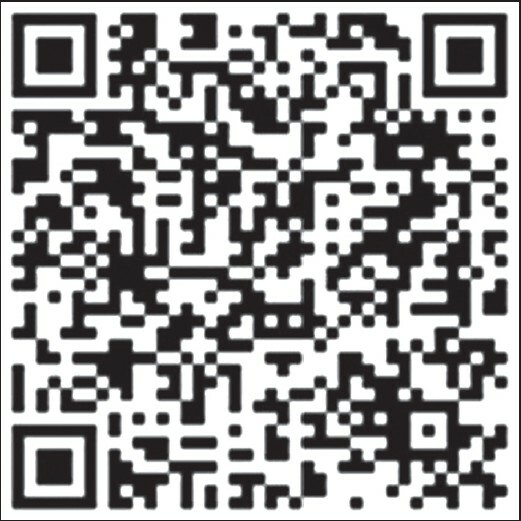 A Novel secret sharing technique using QR code. Int J Image Process 2010;4:468-75. Soon TJ. QR Code. Synth J 2008;3:59-78. Kubben PL. QR codes in neurosurgery. Surg Neurol Int 2011;2:104. García-Betances RI, Huerta MK. A review of automatic patient identification options for public health care centers with restricted budgets. Online J Public Health Inform 2012;4:1-16.